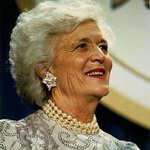 Former First Lady Barbara Bush established The Barbara Bush Foundation for Family Literacy, which is now the nation’s leading advocate for family literacy. The charity believes that family literacy is key to solving today’s most critical challenges: social and economic mobility, quality of life, and global competitiveness. With support of individuals and corporate sponsors, they provide educational opportunities for young children and their parents, helping them achieve the literacy skills needed to pursue a brighter future. Barbara Bush has passed away, but we remember her charity work. Google trends for "Barbara Bush"
We don't have any videos related to Barbara Bush.